As I sit down to write this I've just come out of hosting 24 family members at my home for a combination Thanksgiving/family baptism event. Soon will be the Christmas season and especially during the holidays we often travel to or host family and friends in our own home. What follows are some ideas designed to help you prepare for and host family and friends in your home from the angle of being a responsible gun owner. We are creatures of habit and routine and when something disrupts that routine we risk a lot of good habits and practices falling through the cracks. For example, in my home, I lock all doors and windows all the time. If a door or window is open then it can't be locked but as soon as it is closed it is locked even if we are just letting the dog into the backyard. Locking the door is part of closing the door. When I have guests in the home they likely don't have the same habit. This means I do regular checks on all doors and windows and especially perform a thorough check right before bedtime when the home is most vulnerable to a break-in. I also check outdoor lighting and consider if any bushes need to be trimmed. These are good practices regardless, so I make a point to do it before I'm hosting company. Generally, my visitors are going to be parked in the driveway or on the street at night and double checking those things will benefit everybody. If you have good relationships with neighbors (and you should) then it might also make sense to inform them that you are expecting company. That will eliminate concerns or tension if your neighbor sees random people coming and going from your house at odd hours. When you have more people in your home you need to update or establish your response plan and protocols. You may not be able to respond to a bump in the night the way you normally would knowing you have additional guests in the home. In addition to your response plan needing adjustments, there may be some things you want to communicate to your guests. It may not make sense to brief them on their role in an emergency or run some drills upon their arrival, but you certainly can tell them that they shouldn't come and go after a certain hour of night or that should they need something after others are asleep they should turn on certain lights in the home or do whatever else is needed to help you identify if there is a potential threat in the home. If you have a security system you may find it prudent to show your guests how to disengage and engage the alarm system and show them some of the other basics of operating the system. When I travel (drive or fly) I generally bring a small gun safe with me that I can use to lock up my gun at night when I'm asleep. I talked about the importance of that in a Hotel in a different article, but even when I stay with family I think it is responsible and respectful of the people hosting me that I lock up my gun at night. So I'm inclined to provide that option to people who stay in my home. When you host guests in your home, especially ones who you know tend to be armed or travel with a firearm, you should consider offering secure firearm storage. 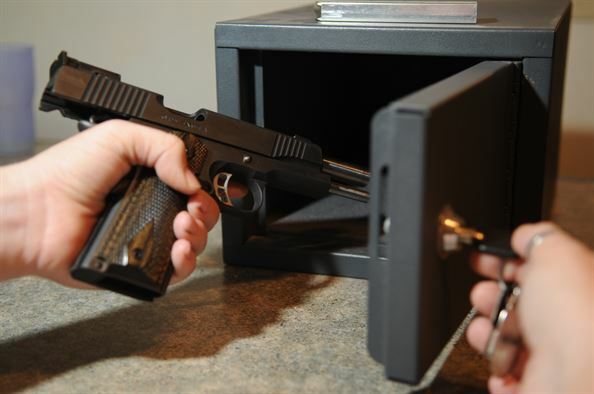 A simple small safe can be handed over to someone with some thoughts such as “here is a small safe you can use to lock up your gun at night.” Provide them with the combination and if you feel strongly that you want their guns locked up be sure to tell them so. Do you use a safe? If you have a permanent guest room setup you can also just make a small safe part of that room and when new guests arrive you can make the safe part of the overall introduction and orientation. In that past, I've done research and provided my thoughts about firearm storage with an emphasis on nightstand related questions (see thoughts here). Whatever your normal is, you may want to make changes when you have guests, especially if those guests include children. You may choose to not secure firearms in your home normally, either because you have no children or because you feel your children are educated and trained. Can you make those same assumptions about the guest children you've invited into your home? I don't think you should. What other considerations have I missed? What are some of the things you do differently when you have guests in your home? Share your thoughts in the comments below! Should You Take a Combat Carbine Class?